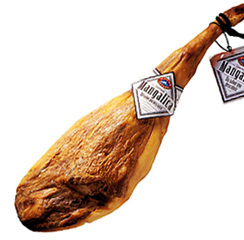 Mangalica Ham is a delicious tasting Spanish ham, completely natural, perfect for all types of diet. This High-quality ham is rich in proteins with multiple nutritional qualities. 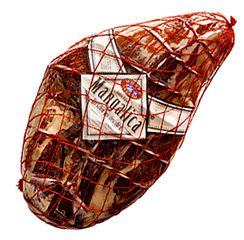 Possessing large amounts of B vitamins and large doses of iron and zinc, which are essential in our body, Mangalica ham is recommended for a healthy balanced diet. Elaborated from the Mangalica pig, who shares its origins with the Iberian pig (Mediterranean Trunk), is considered an animal with optimum qualities for making slow healing hams. Exquisite delicacy with very good acceptance, the Mangalica Ham is a different product, with its own flavor, which merges extraordinary raw materials and tradition.